The Henri Lloyd Arkansas is a lightweight and super comfortable deck shoe. It features a non-marking molded rubber permanent grip outsole unique to Henri Lloyd. Eyelets are made from non-corroding brass. 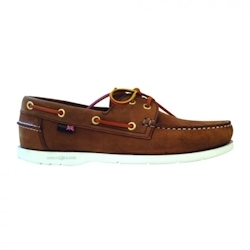 The Arkansas is finished internally, with a genuine leather footbed with HL branding.